Well, this one made me wish we could revisit the Hayes code for a day or two, just to clean up the mess. Here we have a film where the protagonist is a sociopathic criminal that rises to success by being a sociopahtic criminal. The film glamorizes the vapid and mindless parrots that serve as mouthpieces for the “news” while, I think unintentionally, laying bare the reality that these are some of the lowest life forms on the planet. The picture opens with Jake Gyllenhaal’s character engaging in a bit of petty theft, which he soon escalates into felony robbery. And, to put it bluntly, the type of personality that commits strong arm robbery isn’t exactly what one might call “smart”. Put it another way, would you attack, maybe even kill someone and then face up to 20 years hard time to steal $40? No? Anyway, from here our lowly criminal stumbles onto an accident scene where he realizes he can capitalize on human misery by videotaping it for the “news”. He meets his equally sociopathic burn-out counterpart in Rene Russo’s character and we’re off to the races. So, why reference the Hayes code? For those of you not familiar, well….Google it. For those of you who are, one of the tenets is that the bad guys never win. Samuel Fuller once said in an interview that he couldn’t show how much money a criminal could really make because every kid in New York would be out the next day committing crimes. And yet, here we have the vaunted “press”. They have a great sales pitch, but at the end of the day, they’re rarely more than war pornographers, thrill seekers and people that can watch someone breathe their last breath through a lens and only reflect on the money the shot is worth. 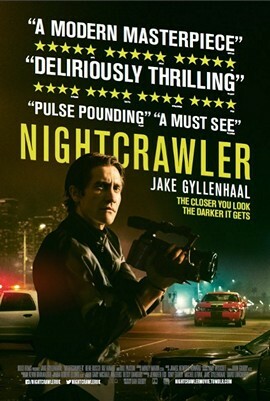 Somewhere in the middle of “Nightcrawler”, Dan Gilroy manages to glorify that, while merely tip-toeing around the depth of the subject he so fecklessly tackled. Politics aside though, it’s a hell of a well made picture. Gilroy brought the suspense, the tension and the “movie”…he just left his responsibility behind.